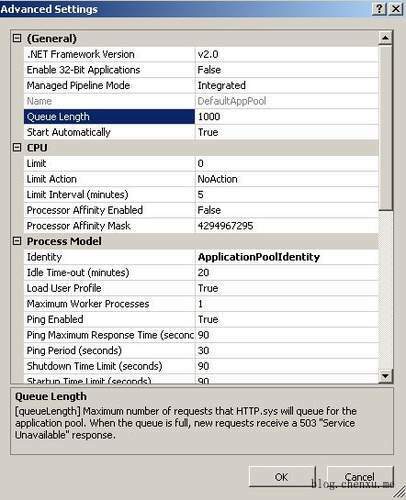 ‍‍Application pool queue-length limits prevent large numbers of requests from queuing up and overloading your server. 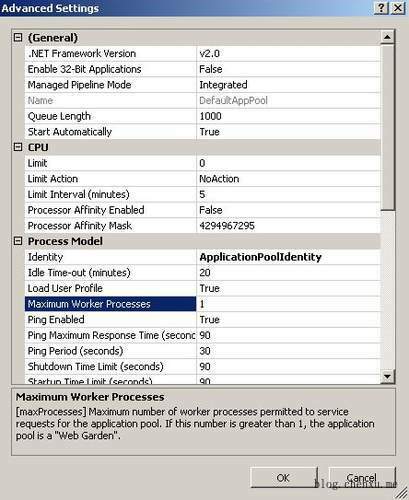 When application pool queue-length limits are enabled, IIS monitors the number of requests for a designated application pool queue before queuing a new request. If adding the new request to the queue exceeds the queue size, the server rejects the request and sends an uncustomizable 503-error response to the client. 因为这个是属于应用程序池的一个属性，因此选择应用程序池，然后点击 Advanced Settings -> Queue Length，默认为 1000. A request arrives at HTTP.sys. HTTP.sys determines if the request is valid. If the request is not valid, it sends a code for an invalid request back to the client. If the request is valid, HTTP.sys checks to see if the request is for static content (HTML) because static content can be served immediately. If the request is for dynamic content, HTTP.sys checks to see if the response is located in its kernel-mode cache. If the response is in the cache, HTTP.sys returns the response immediately. If the response is not cached, HTTP.sys determines the correct request queue, and places the request in that queue. If the queue has no worker processes assigned to it, HTTP.sys signals the WWW service to start one. The worker process pulls the request from the queue and processes the request, evaluating the URL to determine the type of request (ASP, ISAPI, or CGI). The worker process sends the response back to HTTP.sys. 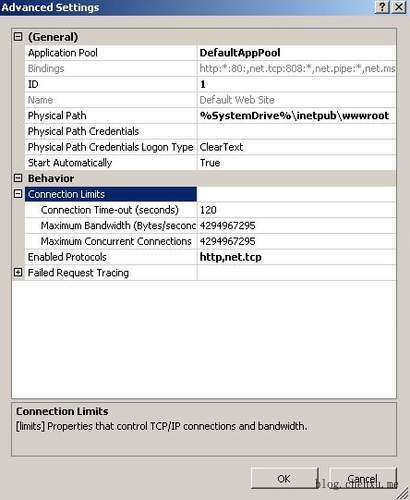 HTTP.sys sends the response back to the client and logs the request, if configured to do so. 从上图，可以看出当前的 connection 为 5，并发处理的请求数也是 5，而队列为 0. 从上图，可以看出当前的 connection 为 10，并发处理的请求数也是 10，而队列为 0. 从上图，可以看出当前的 connection 为 11，并发处理的请求数则 10，而队列为 1. 从上图，可以看出当前的 connection 为 20，并发处理的请求数仍旧为 10，而队列也为 10.